The cost is usually the biggest selling point, even compared to alternative sheds and garages. 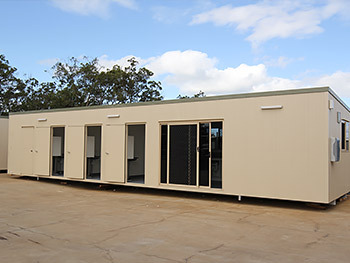 Basic construction of modular buildings can be completed in just one day, with more complex installation taking slightly longer. Built using the same Colorbond roofing material we use for our sheds, so durability is guaranteed and can be easily recycled. Transportable buildings get their name for a reason, and are designed to be easily portable depending on your needs at any given time. We often encounter customers building home offices or secondary buildings on their properties. 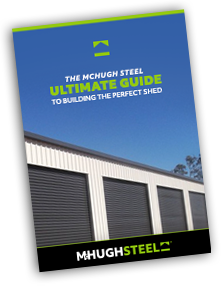 The decision to choose between one of our customised sheds or modular buildings is not always easy. Choosing to have a fixed shed installed will allow for garages to be added and can be customised to better suit your business or home. Our modular buildings on the other hand are cheaper than a fixed shed and can be installed quickly and removed easily if necessary. If you’re still having trouble deciding between the two feel free to contact us with any of your enquiries. We’re happy to discuss our existing plans or design a solution that best suits your needs. If you’re looking for larger solutions, take the time to consider our industrial sheds or farm sheds depending on your particular requirements. View our Relocatables Gallery to see our range of relocatable buildings.